Have you recently tried to contact me and I didn't respond? My server wasn't sending emails, so I never received them! Click Here to contact me again. Nothing pleases me more than sitting down with 10 jars of peanut butter and a spoon to taste and review each one. Sometimes I think that’s what heaven would be like, except you wouldn’t get full and the jars wouldn’t run out. But my spiritual beliefs in peanut butter have yet to enlighten me as to why all the different brands, varieties and flavors of peanut butter that exist in America have yet to spread to the rest of the world. In terms of peanut butter technology, the US is light years ahead. No complaints here except that I’m unable to leave the country for extended periods of time. Now for this round of reviews, I go over some crucial store brands you may have missed as well as some interesting flavored peanut butter from upstate New York. 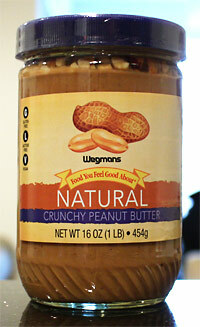 My new favorite grocery store, Wegman’s, makes some fantastic natural peanut butter. This variety is perfectly ground to a coarse texture that is rich and thick. It comes unsalted, but that’s easily solved by adding around 1.5t of kosher salt per jar. Running at a reasonable price of $2.99 per jar (although nearly twice the price of my current favorite, 365 creamy) this natural peanut butter is a must try! I kind of like the fact that it comes unsalted because I can control the level of salt. And unsalted, it’s perfect to use for Peanut Butter Banana Pudding or any other dessert. Similar to the creamy, this crunchy peanut butter is fantastic. The chunks are very crunchy and the peanut butter in between is coarsely ground, thick and delicious. Once again, if you prefer your peanut butter salty like I do be sure to add 1.5t of kosher salt per jar. I tend to savor this one for special occasions, such as a perfectly ripe banana begging to be loaded with peanut butter or to put on a warm Triple Threat Scone. 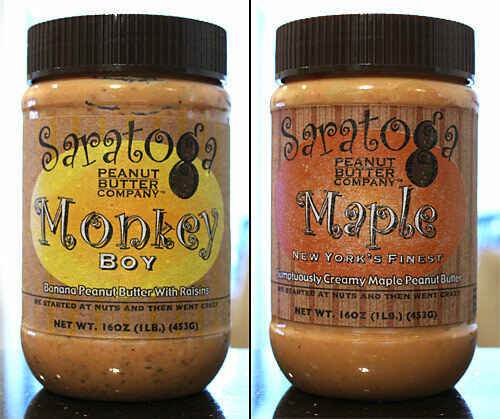 Saratoga is a brand I have not heard of, but 2 of my Aunts went to a farmer’s market and found a variety of offerings from this company. The texture of this peanut butter is very nice, thick and creamy with tiny chunks spread throughout due to the nature of a coarse grind. When you open it up, the maple smell is overwhelming so I expected a strong tasting and overly sweet peanut butter. I was right in only one aspect, the maple flavor was very powerful but there was only a hint of sweetness. I like the low level of sweetness but they added a bit too much maple flavor (maple extract perhaps?) without the sweetness to back it up. An interesting idea, but either a reduction in maple flavor or increase in sweetness is needed. I tried it on a Colossal Pancake topped with maple syrup but that overwhelmingly maple flavor still came through. Maybe it would work better in a loaf of Dark Chocolate Peanut Butter Banana Bread. Despite my lack of enthusiasm for Saratoga’s maple offering, this flavor is much more interesting. This is a banana and raisin flavored peanut butter. The raisins are finely chopped and therefore are more evenly spread throughout the mixture. In addition, there is some kind of banana flavor or essence added to the peanut butter, similar to the maple flavor, except not nearly as strong. Just the right amount of sweetness brings this flavor to life. The only downside is that if you pair it with anything, even a banana, the delicate flavors of the banana and raisins are almost unnoticeable. Now this flavor works well on a Colossal Pancake, but don’t use too much maple syrup on top – a sprinkle of sugar works better. Here’s a unique offering from Trader Joe’s. There is a great flavor with crunchy chunks. It’s salted nicely but could use a pinch more in my opinion. The addition of the flaxseed is a tasty and healthy addition but confusing at first. Flaxseed has a natural sweetness which complements the fresh peanut flavor but it adds lots of little crunches on top of the peanut chunks. While I eventually enjoyed the texture, it originally felt like there were little bits of plastic in it. A 12oz jar will cost you $2.99, but it’s well worth a try. Don’t refrigerate it like they recommend, it becomes too thick and nearly unusable. A glob of this is great for added nutrition in some Peanut Butter Cereal. Not enough peanut butter for you? Then check out all of my Peanut Butter Reviews. So, did I sell peanut butter to your aunts? Haha, I definitely remember two women buying peanut butter for their nephew in those flavors… what Farmers’ Market did they go to? Thank you for the reviews! The maple has the strong flavor+less sweetness because we try to keep everything as healthy and low in sugar as possible. I’m glad you enjoyed the monkey boy! Try it on a grilled peanut butter sandwich with mashed banana or honey if you need something sweet in there. It really showcases the banana/peanut/raisin flavor! I have a suspicion that you would enjoy the dark chocolate (Chillin’) and white chocolate (Blizzard) Saratoga peanut butters. They’re really delicious! It’s very possible! They were probably at a Farmer’s Market somewhere in Westchester? I like the health aspect of the flavors, having very little added sugar, but I think the maple flavor was just too strong, it reminded me a bit of the lingering flavor when you try to drink water out of an empty Gatorade bottle. But yes, Monkey Boy is quite tasty and just sweet enough! I think the key there is that the banana flavor isn’t overwhelming but just right. Those chocolate peanut butters sound great, especially since it’s low in sugar. Most chocolate peanut butter has a good amount of sugar that often makes it too sweet. I am on vacation in Hungary right now and one of the first things I noticed when I got here was that they don’t eat PB! I was shocked. So weird. Haha, well I think it’s difficult to find peanut butter anywhere outside the US! Poor you though, you should have brought a jar! Not so, your neighbours to the North are also of the peanut-butter loving variety, we just have fewer flavours up here, since our food regulations are a bit more stringent than yours. BTW, 365 is actually produced in Canada! My mistake, I misspoke! Canada does have a decent array of peanut butter from what I’ve heard. Ok, so outside of North America it’s difficult to find peanut butter! I live in New Zealand and we love peanut butter! We don’t have different flavours really though, just crunchy or smooth, salted or unsalted. Great review- that maple peanut butter has me quite intrigued!!! Intriguing is the perfect word to describe it. Perhaps I should just add some sugar to it…. Yes, we love the flaxseed one from TJ’s. Has a nice bit of crunch. I think you’re right though–could use a touch more salt. The salt brings out the flavor better but I also think it somehow helps the stickyness factor. It IS sticky, isn’t it? But great with jam! I read about that one, I really want to try it but I can’t find that brand anywhere around here. Subscribe to PBB recipes by email?